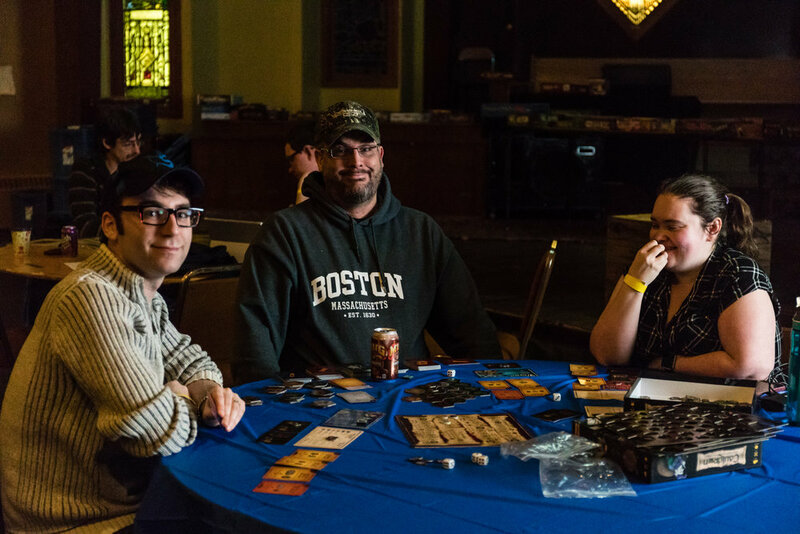 Impossible Realities is a gaming convention based in Saint John, NB, Canada. Founded in 2001, this year will boast their 17th annual weekend long event in September 2018. Each March, Impossible Realities also hosts a one day mini con called March to Oblivion. Sadly I wasn't able to get away from work this year but I did stop by for a couple of hours, teaming up with Creative Lifestyles Studios to socialize and take some photos. Players try Cauldron by Altema Games in hopes of being drawn as winners in the Play To Win. Probably one of the most exciting things about this year's March to Oblivion is that it marked Impossible Realities first ever Catan National Qualifier. 8 players showed up, a little low due to the miserable weather we were having but there's always September if all that nasty snow caused you miss out. The convention provides the winner with airfare to the next phase of the Catan National Championships. Definitely something worth checking out if you ask me. One IR staple, the best one in my opinion, is the Play To Win library. Various sponsors and gaming companies have been helping Impossible Realities since the beginning by donating to the Play to Win. Play To Win features boardgames for players to demo during the convention. Once players play a game in The Play To Win their name goes into a draw to take the game home. Want to maximize your chance of taking home a free game? Play more games... life is hard, I know. Players try Kill Dr Lucky by Cheapass Games. Cheapass Games has been an amazing sponsor by donating to the Play to Win section for several consecutive years now. Another IR staple is the Magic The Gathering Wacky Draft, perfect for the casual Magic player. Never heard of a wacky draft before? As opposed to your typical draft, players get 3 packs of cards (random or selected) from various different sets to draft from. Not necessarily ones that compliment each other either. This makes for some crazy (or wacky) deck builds and is a pretty casual format to the game. My favourite thing about the Wacky Draft is how laid back it is. I've never seen anyone left hung out to dry when they weren't feeling confident about their pulls. The more seasoned players are always willing to answer questions and give suggestions to help you maximize the potential of your deck (in between matches of course). One of my favourite things about the current venue is the sectioning and multiple side rooms. Previous venues consisted of a large hall with multiple tables which could get pretty loud and distracting. The new venue is actually a maze of private rooms that you would never know existed and will probably need help finding the first couple times you attend. This setup provides RPG gamers with a quiet space to play their campaigns. Role players take home prizes too. DMs hand in their attendance sheets so players can be entered in to a draw for a few RPG related prizes. I believe there is a prize draw for DMs as well. I didn't see it with my own eyes but I did hear that many tables this year were randomly surprised with chocolate polyhedral dice sets. Impossible Realities is mostly focussed towards tabletop gaming but there are a couple additional parts that most geeks are able to appreciate. There are a lot of fantastic vendors that return every year. Seeing all the hand made geeky crafts makes it hard not to throw all your money at them so I recommend making a budget and only bringing that amount with you. In recent years Impossible Realities has added cosplay to their convention. That's why Creative Lifestyles Studio showed up with me. I guess we missed out on some really great cosplays that attended earlier in the day but we stuck around regardless for an impromptu photo shoot with a few of the remaining cosplayers. This portion of the event has been taken over by Bree Bree Cosplay and she hopes to attract a larger turn out for the September 2018 event. Check out more cosplay images from March to Oblivion HERE. Laura of Get Creative with LacyLola reviews her photos with Creative Lifestyles Studio. I would love to keep going on about all the other things I love about Impossible Realities (Do You Worship Cthulhu, Board Game Blitz, LARP, Panels, etc) but I can only make you read for so long. I'll be posting the rest of my images on facebook in the next couple of days and suggest you check out the Impossible Realities Gaming Convetion page by clicking HERE. Hope to see you in September at Impossible Realities 2018.